Hi Dolls. Sorry for my late posting, but I was kinda busy. Sorry. So continuing my series: it's time for Workout Wednesday. I'm going to tell you about some changes in my lifestyle. I now decided to start running again, because it's such a beautiful weather in the summer. And running is definitely my favourite type of workout. You can relax and enjoy your thoughts, while doing something that is good for your body. So I recommend this to all of you. You can also add healthy lifestyle and you can definitely forget about the diets that never work. I now try to eat more healthy. I make smoothies for breakfast, try to eat more vegetables for lunch and have a really light dinner. Also don't forget about diversity. There are lots of different types of food that are good for you. Smaller portions, healthy eating and working out is great for your body. I think that many of you will agree with me that, these things are keys to success. The "scenery" where I love to run. 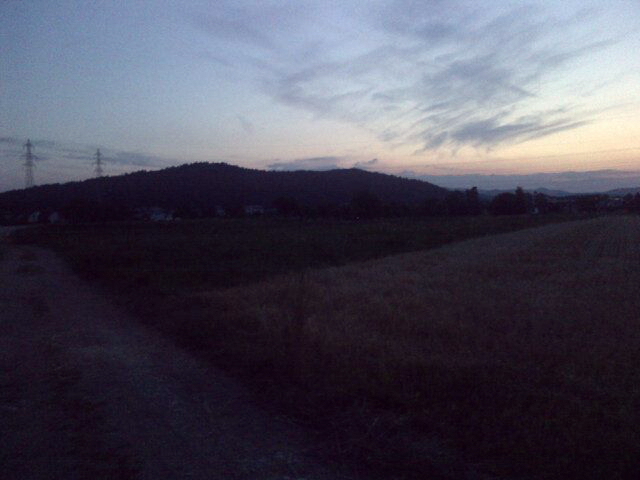 But it's a bit dark, because I like to run at the evenings, when is much more peaceful. What kind of workout do you prefer? Let me know by commenting below. Love the pic! Yeah I run several times a week now and I have to say I really admire you for loving it! I do it, I'm faithful but love...oh just not there yet! I've recently started exercising regularly, after spending most of my life convinced that exercise was for chumps. Ha. Running is my favorite kind of workout too! Right now I'm still kind of in a phase where I need outside sources of inspiration to keep the idea of working out appealing. I'm glad you've decided to provide one!